I just loooove this story. You guys at Kentucky Fried Chicken, er . . . KFC, you’re my new heroes (even though I keep kosher and can’t eat there). The only thing missing here is video from what they pulled off on October 22nd. Normally, I’m against terrorist attacks on U.S. soil. But the United Nations–the one legitimate terrorist target–isn’t technically U.S. soil, and I really wish some terrorists had dreamed up this hilarious Col. Sanders scheme first. I also love how UN officials are backtracking and trying to excuse their huge blunder. Sorry, guys, you were p3wned. Borat/Bruno, eat your heart out. 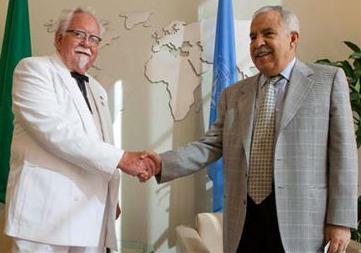 Red-faced United Nations officials on Monday admitted to a major security lapse after a UN guard helped Kentucky Fried Chicken’s “Colonel Sanders” gain access to restricted areas. The guard escorted the white-suited intruder past security barriers, where he got a handshake from the UN General Assembly president, Dr. Ali A. Treki of Libya. . . . The incident last Thursday apparently was part of a publicity stunt by the fast food chain, which is seeking to promote its grilled alternative to its signature fried chicken. It had dispatched the Sanders look-alike, identified by KFC as Robert Thompson, and also wrote to Mr. Ban. Ms. Montas warned the UN could take legal action against the company, whose letter, signed by KFC president Roger Eaton, asked that the secretary general register the “Grilled Nation” of grilled chicken eaters as the 193rd UN member state. I’d take the Grilled Nation as a UN member any day versus the Third-World, racist, America-hating, Jew-hating countries that are in there now and part of its pretentious “General Assembly.” A Grilled Iran sounds nice, though, especially if it’s grilled on hot charcoal. Mr. Treki, who introduced world leaders at the recent General Assembly summit, posed with the Sanders look-alike in a lounge area frequented by diplomats and government leaders. “Brief encounter”? Sounds like Libya’s Mr. Treki visits a lot of rest stops and George Michaels’ concerts, if ya know what I mean. No. Because he’s a very stupid and gullible man. UN TV crews eventually raised the alarm after being stunned when the impersonator approached cameras set up for diplomats, and began making claims about the extent of the “Grilled Nation.” At that point, additional security guards arrived and escorted him from the building. See, this is the kind of stuff Sacha Baron Cohen should do, but doesn’t have the guts. He’d prefer to punk and trick good-hearted average middle Americans. But far-lefty, nutcase, anti-Western institutions like the UN, fuhgedaboutit. He doesn’t have the guts. Only Col. Harland Sanders a/k/a Robert Thompson has the cojones. It’s kind of funny, huh? A actor playing a fake colonel acts as that fake colonel posing as a fake world leader and gets away with both at the highest levels. Even I’m getting confused. By the way, longtime readers know that I’m a fan of Harland Sanders, a great American, who only saw great success when he was in his 80s. Until then, he had a tough life. I support the petition to put him on a U.S. stamp. Since he died in 1980, that’s long overdue. “The Colonel” should have brought in a couple hundred ‘buckets’ – enough for each ambassador to the Useless nations to put one their head. I do want the Grilled Nation at the UN. That getting ’em po’dunked! Next time you’re in Israel, you can show KFC how much you care. I don’t eat KFC because it’s Tyson chicken and one of these days their muslim workers might just get mad enough to taint the food if they don’t keep giving them their prayer breaks. That was finger licking good. I’m confused about KFC being not kosher. I don’t know about such things, but I would guess it has to do with how the chickens are slaughtered. Unless chickens are considered unclean, like delicious bacon…umm I mean pigs. Or shrimp. Or bacon wrapped shrimp – Debbie, you literally don’t know what you’re missing. Chickens can run around for days with their heads cut off. So what is the right way to slaughter them when if takes the little mothers days to even figure out they’re dead? I’m going to have another Sierra Nevada and think about it – deeply. it has to do with how they’re slaughtered but also the conditions under which they are cooked. Kinda complicated to address here but they are a “clean” animal unlike bacon wrapped garbage collectors. Come to think of it, that’s garbage collector wrapped garbage collector. Slaughter must be done with a perfectly honed knife, no nicks or imperfections in the blade and the butcher is specifically trained to know where to cut so that the chicken does indeed know it’s dead and does not run around. They are then drained of all their blood. What doesn’t come out by draining is removed by salting. and rinsing in water til no visible blood is detected. When preparing them, they must only be cooked in a pan that is kosher for meat. It can’t have been used for dairy. it can’t be prepared with any dairy products and casein which can be found in powdered spices is considered dairy. But as yonason said, come to Israel and enjoy all the KFC, McDonalds, and Burger King you want along with Pizza hut, Dominos and Starbucks. Colonel Sanders sold his entire U.S. operation in 1967 for 2 million dollars. Can you imagine, with the name recognition, what kind of money such a sale would bring now? I thought the Golden Arches has observer status at the U.N.
in the Book of Proverbs it says ” Laughter does the Heart good like a medicine but a bitter spirit rots the bones”. I for one enjoyed the good-natured hum tor in the event and the responses that it generated.There is a whole lot of bitter spirits running about and some laughter can lend a hand. The Loving Kindness of Our Great God and Saviour Jesus the Christ has brought great joy to those who were trapped in religious and non-religious prisons of their own makings.A relationship with The God of Abraham,Isaac and Jacob has set this person and many a person free to worship God while being lifted into a position of friendship and peace with God because of the Loving Atoning Willing Sacrifice of Jesus the Christ.